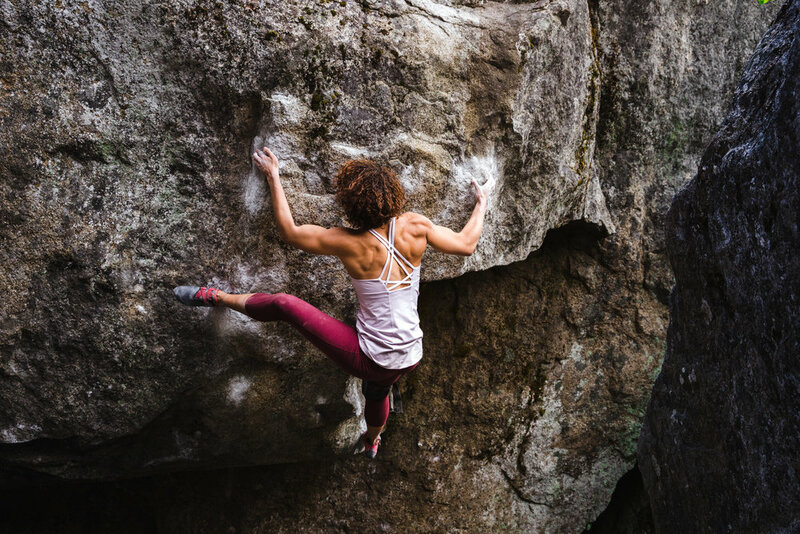 Meet Melise: a climber based out of Seattle, Washington, but originally from Hendersonville, North Carolina. I recently got the chance to chat with her and learn more about her history and her thoughts on training, dieting, and diversity. When did you start climbing? How did you get into it? My mom and sister started climbing before I did. Before I really got into climbing, I did a school project on rock climbing and the psychology of "extreme sports." After doing a multipitch slab climb with my project mentor, I was hooked! I took many months off while I was in college, but I started bouldering regularly when I was a sophomore in college. Have you ever been a competitive climber? I briefly dabbled in competitions while I was in college. I did lots of local competitions and was a part of the Collegiate Climbing Series. I was even able to travel to Nationals. I did a few bigger competitions like Dominion Riverrock. I loved meeting new people and challenging myself to climb in a nerve wracking environment. You mostly post about bouldering. Do you do sport climbing or trad? Hahaha, sometimes and reluctantly. I rope up maybe one month out of the year. I have done some multipitch trad climbs and single pitch trad climbs, but I'm just not as passionate about them as I am with bouldering. I did lead trad for the first time in years for a photoshoot with REI and it was so much fun! I might branch out into those arenas eventually but I'm afraid of heights and feel content using up the rest of my 20s for body-breaking bouldering in the meantime! Such a tough one! I grew up climbing in Boone, NC so that will always have a really special place in my heart. Right now I think my top places to climb would be Leavenworth, WA, Squamish, BC or Red Rocks, NV. Bishop is up there too along with Joes' Valley. Ah, I can't choose! What's your favorite training exercise? Oh, so many! My favorite training exercises are those that reinforce good technique on the wall and prioritize good footwork and movement. Aside from technique and fitness drills, I love campus board workouts, maximum weighted hangs on a one pad edge and weighted minimum edge hangs on a 7-8mm edge. I've also seen the best results from doing one arm hangs on a 20mm edge. A training question I struggle with every day: while hangboarding, is it better to use a larger hold with a lot of weight, or a smaller hold with less weight? The general rule I've learned from reading Steve Masich's blog is that more weight on a larger edge is better, though there are a few considerations to be aware of. If you're reaching close to 70% of your body weight on an edge, plateauing hard or experiencing shoulder pain, I find it better to go to a smaller hold and use less weight. I was able to reach 70% of my body weight on a ~20mm edge, but my shoulders and hips were hurting from the weight after a while. I saw good results from going down to an 18mm and 14mm hold for these types of hangs. Same question, but how about with one arm dead hangs? The same rule applies, except it's even more important to start on a super large edge/finger jug to make sure those teeny stabilizer muscles can take on the strain of a one arm hang. Oftentimes fingers are super strong but those muscles need time to adapt and strengthen for such a demanding task. What's your diet like? Do you follow any special diets? I eat whatever I want and do not give in to the "starve yourself to climb harder" mentality. I really do not respect or appreciate how rampant these messages can be or how they are marketed to younger athletes and adults. I honestly probably eat multiple pints of ice cream each week in addition to candy, pastries and occasional burger and fries. This isn't the healthiest diet ever, but I also enjoy eating salads and cooking daily healthy meals. I try allowing my energy levels to dictate what I eat, and I would rather eat good quality foods (& enough of them to feel completely satiated) than calorie restrict. I'm probably one of the "heavier" women I know in climbing at 130 lbs, but my strength to weight ratio is really good thanks to training. (This year I was able to do a one arm lock off on an 18mm hold for 10 seconds, and hang with 85lbs added on a 20mm edge.) I would advise people to train hard and stop obsessing over the number on the scale! How did you feel when you found out climbing was going to be in the Tokyo Olympics? I felt what I'm sure a lot of people felt: excited, but also a little unsure of how this was going to impact climbing and access concerns. How great would it be to see climbing appeal to a wider audience and hopefully become more diverse and inclusive? Ultimately it will be nice to see athletes compete, be recognized and hopefully be able to have a paid career in climbing. What advice do you have for new climbers? My advice to new climbers is to have fun. Don't worry about getting strong quickly, learn basic techniques first and don't touch a campus board or hangboard too soon! Injury sets you back far more than the small gains you might make from hopping on the hangboard too quickly. Climbing is initially the best form of training—arguably for many years, and doing so with people who are motivated, stronger or more experienced than you is a great goal to have. Otherwise, be infinitely curious about climbing, don't be shy—ask questions and keep trying new beta on climbs that work well for your body type. We are all different and have our different strengths; seek out yours (& don't forget to work those weaknesses from time to time) and enjoy! You have been pretty outspoken about diversity and climbing. Why is diversity in climbing important? Diversity is important in climbing and so many other facets of our life. It is so valuable to have a wealth of different perspectives and experiences that enable us to be more open minded, receptive and empathetic to others. It is important for youth and adults alike to see men and women of color not just participating, but thriving in a given community or career and represented in a positive way. The climbing community is largely homogeneous and unintentionally alienates a lot of it's members when it only highlights or raises awareness about issues that cater to a majority. You volunteer for Vertical Generation. Tell me about it. Vertical Generation is a non-profit, founded by Julie Gardner and Marc Bourguignon in Seattle, that gives the climbing experience to youth who may otherwise never have the opportunity. They have partnered with organizations like Mary's Place, Refugee Women's Alliance and International Rescue Committee to bring kids to the gym for climbing and dinner. More recently, they have started organizing outdoor trips to take the kids climbing in their own backyard. Most of these kids and their families have never been outside of the city, much less hiking and climbing. VG is also starting a Stonemasters Mentorship program to pair youth with climbing mentors for biweekly programming. They have also begun organizing climbing trips for highschoolers at the University of Washington wall in addition to providing campus tours and resources for applying to college! Not only is Melise an amazingly strong climber, she is super smart and has numerous other interests! She is currently managing a neuroscience lab and applying to cognitive neuroscience PhD programs. What motivated you to choose a career in Science? I have loved science my entire life. I decided to study evolutionary biology in college because of an AP Biology teacher in high school. She was so intelligent, firm, no-nonsense and had this wealth of knowledge that made me think, "I wonder how she sees the world with such intricate knowledge of biological processes." I wanted that perspective, I loved being analytical and asking questions, I never really questioned my passion for science because it brought me such genuine joy. Have you done any other sports? You have the cutest pup ever! Tell me about Rupi! Rupi is my pride and joy. She is an 8 month old Frenchie puppy and is named after the poet Rupi Kaur. She goes on all of my climbing trips now and loves chewing on sticks and falling asleep on climbers' laps. Yes! Aside from science and climbing, I enjoy baking and consuming a lot of sugary treats, languages (I minored in French in college and want to learn more! ), volunteering, trail running and dancing. (I have spent an embarrassing number of hours trying to replicate Beyonce dance moves when I'm home.) I also love reading (Russian lit, poetry, nonfiction, etc) and writing or talking about inequalities I see and experience in my various communities. Follow Melise on instagram (@meliseymo) to learn more about her adventures!